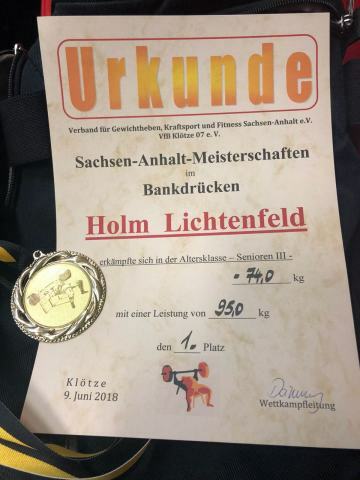 As the result of competition "The bench press championship of Saxony-Anhalt" (ger. Sachsen-Anhalt-Meisterschaft Bankdrücken und Kreuzheben), held on 9 June 2018, the first place was taken by our colleague Holm Lichtenfeld! The competition was held in Klötze, Germany, on June 9, 2018. All the winners were awarded with medals and certificates. Traditionally Hubert Weiss, the managing partner of eastconsult, personally congratulated the winner. We are proud that Holm Lichtenfeld achieved such perfect results! We wish our colleague enormous life energy, new ideas and their successful implementation, optimism, further victories and new achievements!